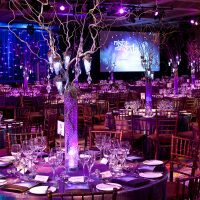 Over 700 of BC’s philanthropic and health care leaders gathered for the TELUS Night of a Thousand Stars gala presented by Capital Direct at Parq Vancouver on November 10, 2018 and raised over $4M and counting in support of a vital new piece of equipment — a 3T MRI machine — as well as other priority programs of Vancouver Coastal Health. The 3T MRI machine will help meet rising demand for diagnostic imaging and provide the people of BC access to the highest level of diagnostic accuracy, ultimately reducing wait times and providing better patient outcomes. “Every year we are deeply humbled by the generosity of our community, and this year was no exception,” says Barbara Grantham, President & CEO, VGH & UBC Hospital Foundation. We were also honoured to present the 2018 Leadership Award to the Gaglardi family in recognition of their $25 million gift towards the Future of Surgery campaign which will transform surgical care in British Columbia; by investing in the infrastructure at VGH and UBC Hospitals. From all of us at VGH & UBC Hospital Foundation, thank you to our donors, sponsors and health care partners for being unafraid of embracing new health care possibilities. Our success would not be possible without your fearless generosity.